OpenPetra makes your administration staff and donors happy! 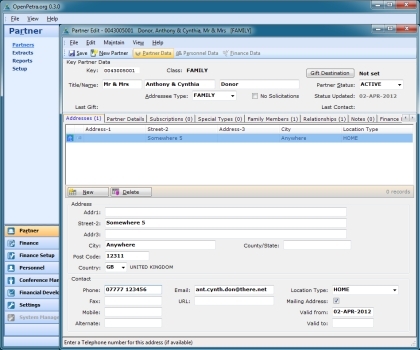 Recording address and other contact information of e.g. individuals or organizations; setting up of subscriptions, etc. Provides general ledger, gift receipting, accounts payable and budgeting. Supports transactions in any currency. Management of personnel and application data. Processing of data for participation in short term events. Supports a person managing a conference in recording who will attend, payments, assignment of accommodation, organisation of groups for activities, arrival and departure arrangements.